With a new season comes a new wishlist. Not sure if it's just me and it's probably a little cliche (okay, a lot cliche) to match lip/nail colour and make up with the season. I guess for us Aussies since we don't really get a full blown winter, we make up for it in attempting to look and dress the part. I love vampy reds, plums and wine coloured lips for autumn and winter, as well as black blues and deep cherry reds for my nails. A little of pinched cheeks don't hurt either for that I've-just-been-out-in-the-cold-wind look. I think it's the only time (except maybe for night and special occasions) that I can really get away with wearing a lot of dark colours and not be labelled a goth. I also love coats and anything oversized and slouchy really (especially of the monochrome variety), though I'm trying the trend of injecting a bit pastel into the fold (note the baby pink boyfriend coat). 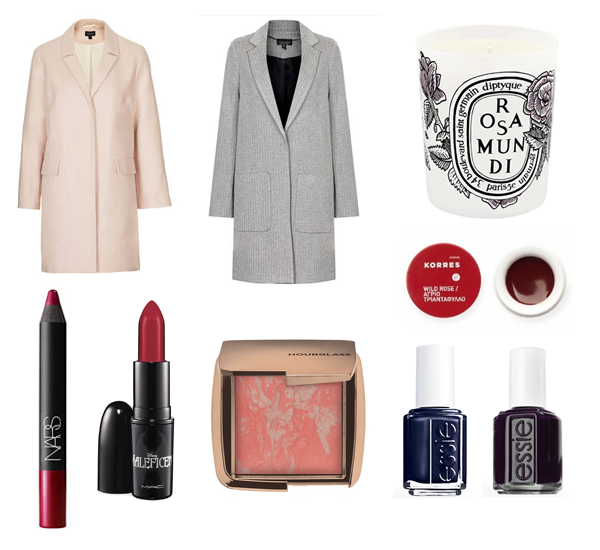 I'm also lusting after some new candles, as well as a quality lip butter to take care of my lips on cooler days (with a nice touch of red of course). I have Essie After School Boy Blazer and it is an amazing polish! I really want to try the Hourglass blushes and the powders too, they sound so good. If only I were a millionaire I would have all the things!!! I just got my hands on the hourglass ambient lighting powder and boy it really is worth the hype. Now I want to get my hands on one of their blushes! They look beautiful, I swatched a couple in Liberties and was very impressed! i can imagine the maleficient collection by mac would be a great collection to have!! Same here! I love wearing darker lips and nails during the cold months. Love this wishlist!